I was born is Israel in a northern town along the seashore, and ever since I remember myself the sea has been an integral part of my personal and family life. Throughout the seasons of the year and in any mood, I go to the beach for a swim or a stroll. The sea and the natural shore, ceaselessly changing, always provide me with joyful and exciting surprises, particularly after stormy days. The composition of the light, the air, the water and the sand, the shapes, the textures, the colors, shades and shadows, the softness and the intensity which I absorb through all my senses, are deeply assimilated into my soul and are part of the language expressed in my works of art. Since my childhood I have been engaging in various types of creation, drawing and painting being the major fields. Currently these fields are also important to me and serve as the initial small window to my work in ceramic sculpture, while these constitute a kind of entrance door to intrinsic worlds. I am a graduate of Visual Design at the Neri Bloomfield Academy of Design and Education, in Israel. I have engaged in Graphic Design for about 10 years, out of which I managed my own studio for 7 years. The increasing computerization of the field generated within me a desire for real manual work, such that senses directly the material. And as much as technology in the design field became more virtual the more I felt an increasing desire to engage in designing raw material. Soil. Clay. Consequently, I shut down the design studio and turned to realize my old love for ceramics. I studied and delved into it with the assistance of various teachers, in art centers, workshops and private lessons and created my own functional ceramic. The family relocated to the United States in (8/2009 – 8/2013) constituted, on my part, an opportunity to reach the goal I have aspired for – to create and express art via ceramics. 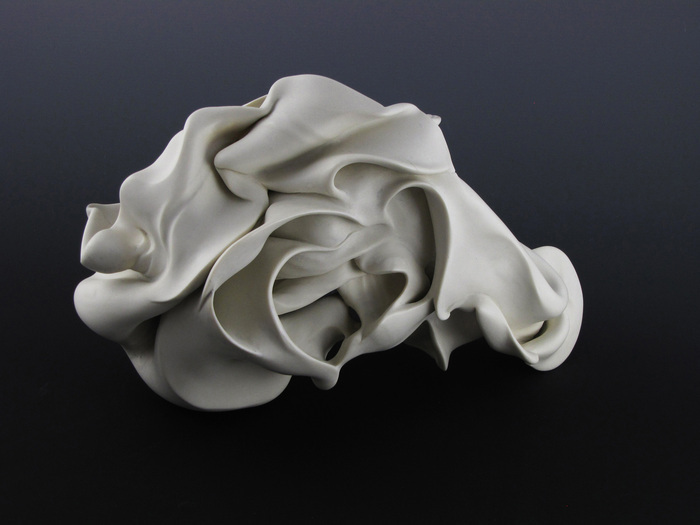 Two years of focusing on ceramic sculpture, instructed by Regis Brodie at the Skidmor College, has helped me a lot. My work is a quest, an exploration, discovery, attentiveness, an exposure. I am seeking the spontaneous, intuitive work, free of intervention of criticism and control that will be expressed at the more advanced stages of the work, and will thus express the importance of meticulous accurate esthetics as an expression of beauty. I regard this polarity between the spontaneity on the one hand and the meticulousness on the other, a motif that characterizes my ceramic sculptures, which were first created in a free exploration of the material through the work of wheels combined with free hand work, continued by: opening, removing, entering into the shape's depth in search of what is within of what is hidden behind the winding partitions of the material. The end of the process reflects the more meticulous side which includes long hours of sisyphean sanding work to the last polish following the final fire. Symbolically, I sometimes feel like an archeologist who is required to a slow and gentle digging, removing layers, peeling and exposing the hidden worlds waiting patiently, desiring to reveal himself or herself. Today, I am back to my country, Israel, and keep on creating my sculptures in my studio near the beach in Atlit. 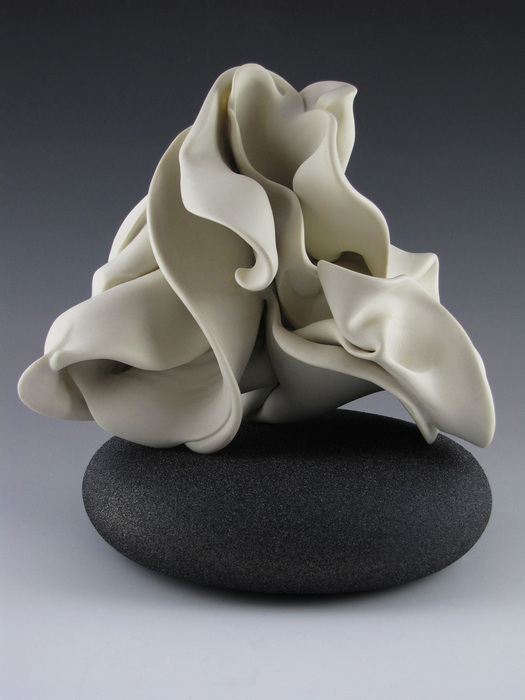 My current works are abstract sculptural shapes, that can be held in your hand and observed from any angle. The lines and movement leads the eye around the shape and into it. My work is create out of an internal drive, as if emerging out of itself. 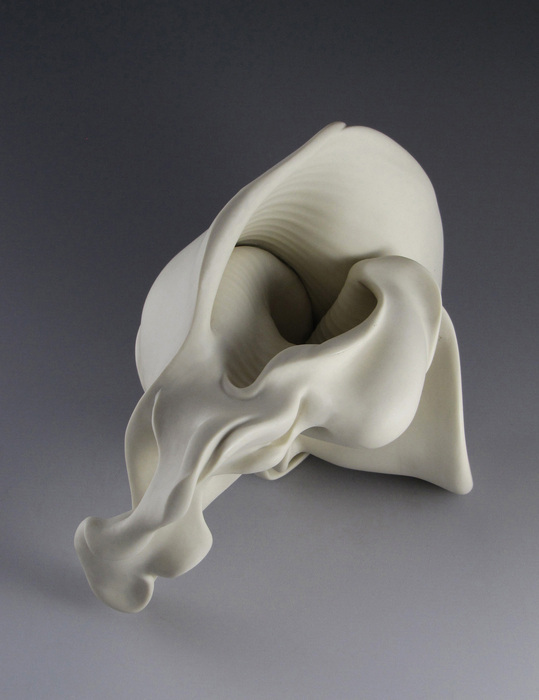 The forms are made from wheel thrown or slab-constructed and altered porcelain, Fired to con 6. The Porcelain remains bare. The works are filed with sanding paper of various grades, before and after being fired. Abstract,Wheel thrown and altered porcelain,Fired to Cone 6,bare Porcelain , sanded.